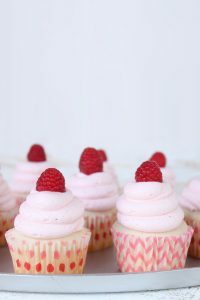 Champagne Raspberry Cupcakes – Bubbly champagne and raspberries come together in this delicious Valentine’s Day cupcake, topped with raspberry buttercream frosting and fresh raspberries. 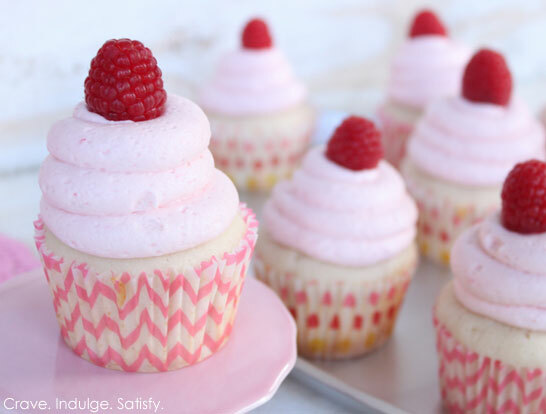 A new cupcake recipe created by our contributor, Lauren Kapeluck of EllenJay Events. Valentine’s Day is just around the corner, do you know what you are getting your sweetie this year? While the standard box of chocolates and a dozen roses are a nice gesture, I’m encouraging you to step outside the norm and create a fabulous treat that will make this year’s Valentine’s Day just a little sweeter! It all starts with a bottle of champagne and some fresh raspberries! 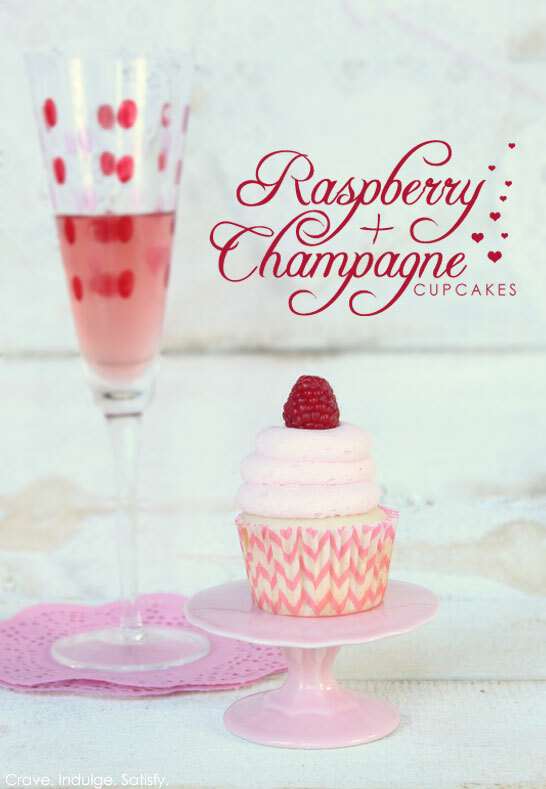 So grab a bottle of bubbly, no make that two, one to bake with and one to drink and get ready to wow that special someone with a batch of Champagne & Raspberry Cupcakes. These cupcakes have been taste tested and given two thumbs up by my hubby so I’m sure you’re significant other will love them too! As I was browsing the champagne section at the store, I decided on Korbel Sweet Rose. 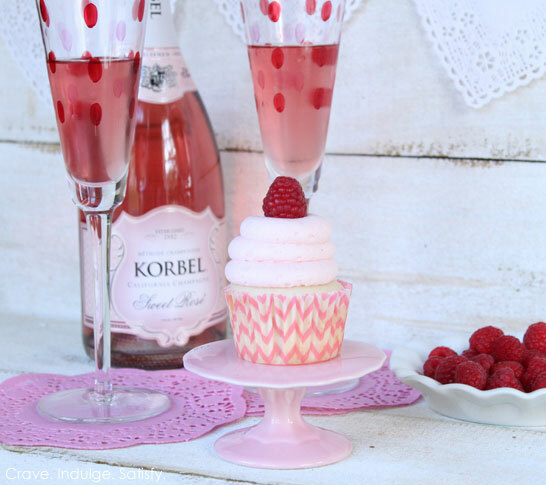 Korbel is a pretty popular and affordable brand when it comes to champagne and I was drawn to the fact that they had a pink variety with a hint of raspberries, which was absolutely perfect for what I had in mind for these cupcakes! If you can’t find the Sweet Rose variety, don’t worry any champagne will do. Champagne was used in both the cake and icing for this recipe. The cake turned out super moist and paired perfectly with a light and fluffy raspberry champagne buttercream. I love the subtle tint of pink in the icing from the pureed raspberries. These cupcakes are the perfect, simple and sophisticated treat for a romantic date night with your honey! 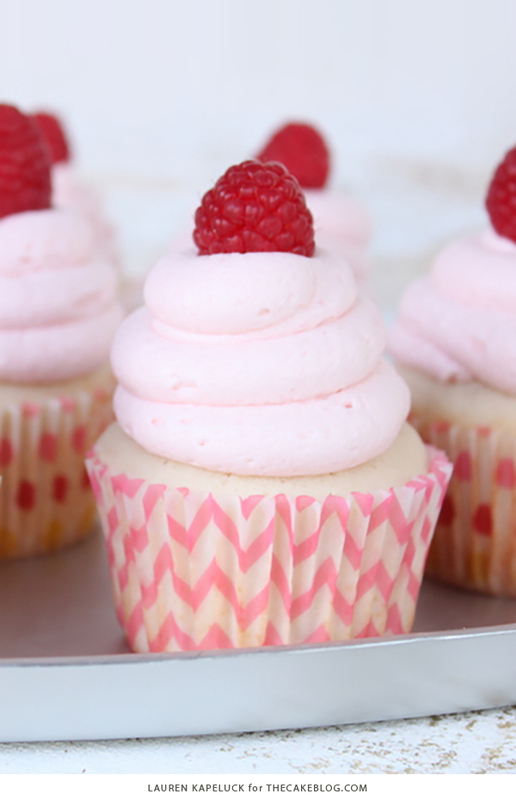 Bubbly champagne and raspberries come together in this delicious Valentine’s Day cupcake, topped with raspberry buttercream frosting and fresh raspberries. Gradually add the dry ingredients and the champagne, alternating, starting and ending with the dry ingredients. Mix until just combined, being careful not to over mix. Scrape down sides of bowl as necessary. Once cupcake are completely cool, frost with Raspberry Champagne Buttercream. In bowl of stand mixer fitted with the paddle attachment, beat butter until creamy. Add in raspberry puree and vanilla extract. Mix well. Gradually add confectioner’s sugar, 1 cup at a time. Mix and scrape down sides of bowl as necessary. Add champagne as necessary to create desired consistency. Place icing in piping bag fitted with large round tip and frost cupcakes. Garnish with a raspberry on top. Beautiful cupcakes and lovely photograph! Wow!!! I love it!!! May I do this with strawberries??? 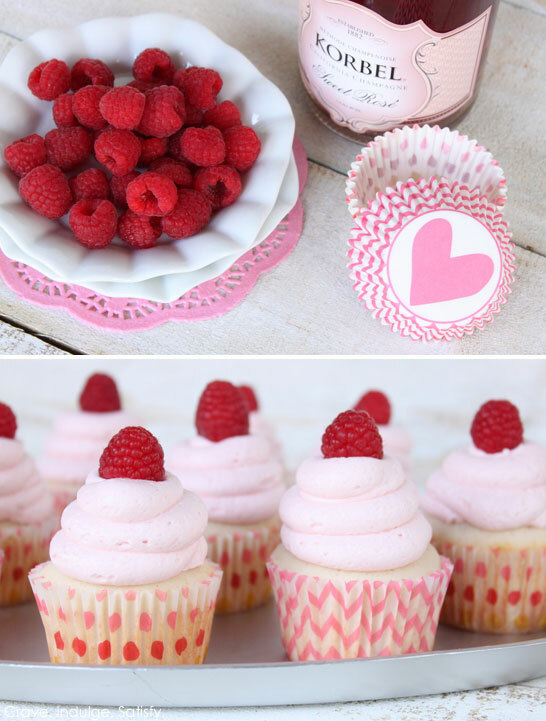 I am totally making these for Valentine’s Day! They look so yummy! I do have one question…what camera are you using for these shots? Your pics always look so wonderful! Juliana – Yes I think strawberries would be equally delicious with this recipe. It was actually the other fruit I had in mind, but decided to go with raspberries! Jennifer Angell – The camera is use for all my photos is the Canon Rebel T1i and I always shoot with natural light. I love love love these! Would you be so kind as to tell me where you bought the champagne flutes from? Absolutely adorable! Many thanks! 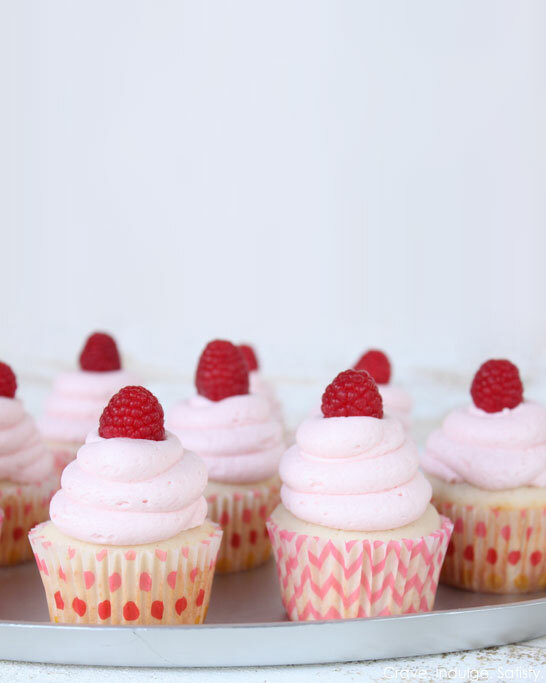 One, maybe dumb-on-my-part, question — the recipe for the Champagne Raspberry cupcakes calls for 5 egg whites in the ingredients list and, then, in the directions it says to add the eggs one at a time. Am I missing something or should the 5 whites be added at the same time? Or, should they be lightly beaten and added to the butter/sugar mixture? This recipe only uses the egg whites. You’ll want to discard the yolks or save them for another recipe. Perhaps a lovely lemon curd or custard. These look sooo good. Planning to make for Mother’s Day at my mother-in-laws house! Do you think they would turn out using all purpose flour?? I was wondering about the egg whites too….do you mean use the whole egg or just the egg whites? Can you answer me asap as I want to male these for a party tomorrow night! I used the egg whites in the batter and the cupcakes are very moist, light and airy, extremely delicious! I love to bake,but dont have any good recipies. Cake flour has a lower protein content of about 8%, as compared to a 10-11% protein content in all-purpose flour. The lower protein content of cake flour gives this cake a tender texture. 2 sticks of butter is equal to 227 grams. I just made this recipe at home and it was marvelous! Best cupcakes ever!! How long should I bake this if I’m doing it as a cake instead of cupcakes? Thanks! We have a cake version of this recipe coming to the blog next week! Stay tuned! Since your initial reply is about a year old, can you answer the question now? Can you make this recipe in cake form for 9×13 pan? Below is a link to the cake version of this recipe! It is a layer cake but you could certainly bake it as a 9×13 if you prefer. Just fill the pan half way full and bake approximately 23-25 minutes or until a toothpick inserted in the center comes out clean. What can you use instead of champagne? Prosecco or Moscato would work great as well! Just wondering – if I’m making this into a cake rather than cupcakes, what size cake pan should I use? I’m unsure of something – once you’ve added the dry ingredients to the champagne – do you then add this to the already wet ingredients (butter, sugar, etc)? It doesn’t seem to say where/what bowl the champagne is in so I assume it’s in a 3rd bowl? You’ll want to work in alternating batches to add the dry ingredients, then champagne, then dry ingredients to the mixing bowl containing the butter and sugar. So start with your bowl of butter and sugar. Add in about 1/3 of your dry ingredients. Then add about half of the champagne. Then another 1/3 of your dry ingredients. Then the last half of the champagne. Then the last 1/3 of your dry ingredients. Mixing on low and scraping the bowl with each addition. These are REALLY good! I just made a batch of these … followed the directions precisely (even down to the champagne recommended) … I don’t have them frosted yet, but ate one to see how the cake was. It is light, moist, tender and airy … just perfect. I will say tho, that the recipe says it makes 20 cupcakes. I don’t know if my egg whites just beat up fluffier or what, but I had enough for 30 cupcakes and I even filled them a little more than 3/4. A happy surprise in my book! Note to poster Priya above me: When you cook with alcohol, the alcohol cooks off and you are left with the wonderful flavor of the alcohol you use. If you just don’t want to use it or would prefer something less expensive, I would think in this recipe you could use any type of sparkling water, club soda or anything with a little fizz. I believe it is the fizz from the champagne and the egg whites that gives these cupcakes their lightness. Hi this recipe sounds amazing! Can I make it the day before and refrigerate until needed? Just wondering if the frosting will keep in the fridge. Thank you so much! Yes, absolutely. They will keep several days in the refrigerator. Be sure to bring them back to room temperature before eating to enjoy the full flavor. I have 3/4 of a bottle of flat Champagne we never finished and wanted to make something with it instead of throwing it away, do you think it would work for this recipe? The cake might not be quite as light and fluffy using flat champagne, but it will certainly taste delicious! As long as your champagne itself still tastes good. Made these for my daughter’s graduation party and they were delish! I made them exactly like the recipe, except that I used seedless raspberry jam in place of the puree- and I was a little more generous with it. These were not overly sweet and had a lovely hint of champagne flavor. Thanks for sharing! The recipe made about 36 cupcakes for me. So glad you liked them Karen! Congrats to you and your graduate! Just made these cupcakes and followed the recipe. Baked them 17 minutes. They tasted great but were very dry. Any suggestions? Are pureed raspberries blended raspberries? Yes, that’s right Amanda! Just blend the raspberries until you have a smooth liquid then pass the liquid through a fine mesh strainer to remove the seeds. You’ll be surprised by the amount of seeds! !